The Rouge Park Master Plan was driven by the vision and values expressed by members of the Rouge Park community including residents, neighborhood organizations, park user groups, and other stakeholders. The Friends of Rouge Park provided opportunities for input into the plan beginning with a Community Visioning Session held on May 18, 2011, and continuing since then with monthly membership. With a grant from the National Environmental Education Foundation, Lawrence Technological University was able to provide assistance in development of this plan. To purpose of this master plan is to facilitate the wise development of Rouge Park, providing for the recreational needs of the people while protecting and enhancing the natural areas. The goal is for Rouge Park to become a well-funded and maintained regional “Jewel” on par with Belle Isle State Park, the Downtown Riverwalk and the Henry Ford while also providing basic neighborhood park amenities and opportunities to experience nature along its river and its forests, prairies and wetlands. We envision Rouge Park someday as an essential stop for any visitor to Detroit with views of downtown from the proposed observation tower, numerous regional fairs, festivals, concerts, events, and opportunities for recreation and enjoyment of its natural areas. Furthermore, a goal of the master plan is to re-forest the perimeter of the park to create a unique “Rouge Park Experience” for visitors inspired by the original park design plan from 1923. Though Rouge Park is situated in the center of a densely developed urban area, as soon as visitors cross the boundary into the park, they should lose all sight of the urbanized surroundings and be immersed in natural and attractive park landscapes just like in New York's Central Park and other great urban parks around the world. "The purpose of the design has been to preserve a beautiful natural environment - free from the rush and the sight of man's dominating influence. Here is to be preserved a natural landscape,"
The park is divided into two zones: development areas and natural areas. The development areas are the golf course, the Brennan Recreation Area, the Joy & Spinoza Recreation Area, the Sorenson Recreation Area, the Joe Prance Recreation Area, The Scout Hollow Campground, the Upland Forest Recreation Area and the Nature Center. The rest of the park is designated as a natural area with no development of park amenities other than what is necessary for access, use and interpretation of these areas. The areas in green are designated for reforestation or prairie restoration. The purpose of reforestation is two-fold. First, as the vast majority of the forested areas in Rouge Park are in the flood plain, a restored upland forest would increase forest and habitat diversity in the park and provide the environmental benefit of storm water and carbon retention. 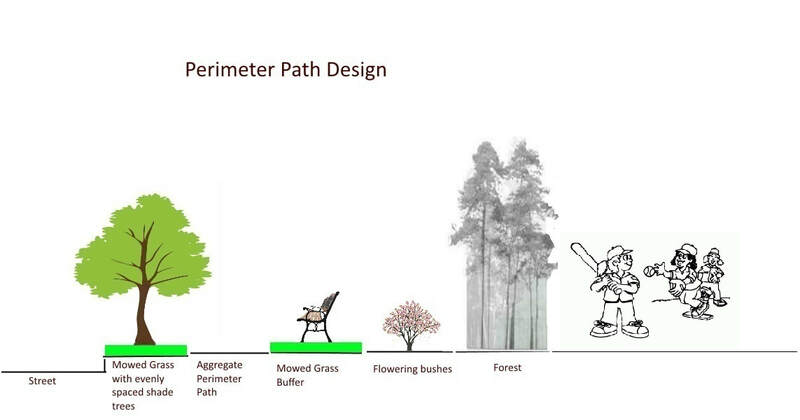 Second, reforestation along the perimeter of the park will create 360º natural vistas within the park. This is an essential step toward the goal of creating the “Rouge Park Experience”. Natural trails are simple soil, wood chip or mowed grass trails. They will be developed and maintained in the Scout Hollow Campground area, Sorenson/Stone Bridge Area, Upland Forest Natural Area, Joe Prance Nature Study Area and the Mountain Biking Area. The nature center will be located on the east side of Outer Drive south of Tireman with a rear viewing deck overlooking the Stone Bridge Nature Trail wetland. It will provide information on the plants and wildlife in the variety of habitats in the park including the river, the riparian corridor, floodplain forest, upland forest, wetlands, native prairie and oak openings. It will be designed primarily for school field trips and families. It will serve as a trailhead for the Stone Bridge Nature Trail, the Upland Forest Trail, the Mountain Bike Trail and the Prairie Pathway. Seven natural areas will have maintained trails, information kiosks, interpretive signage and benches. These areas will have regularly programmed interpretive walks and other educational programs. These areas are the Stone Bridge Nature Trail, the Sorenson Nature Trail, the Upland Forest Nature Trail, the Prairie Pathway, the Joe Prance Nature Area, the Scout Hollow Nature Trail, and the Lahser Wetland. The perimeter path serves four purposes. First it provides neighbors with immediate access to a fitness trail without having to travel to the interior of the park. Second, it beautifies the perimeter of the park with flowering native ornamental trees such as redbud or serviceberry trees, a walking path, and benches. Third, it creates a barrier for neighbors from the noise from ball games, large park events or other gatherings. Fourth, it creates 360º panoramic natural park vistas from anywhere within the interior of the park by eliminating views of the surrounding urbanized area. Benches with garbage cans should be placed along the path every ¼ mile. Mowing in the park serves two purposes: first, to provide access and use of picnic areas, ball fields, playgrounds and other amenities in the seven recreation areas; and second, to provide a five to ten foot manicured visual border along all park roads, sidewalks, paved paths and the perimeter path. In addition to the existing six miles of paved paths, two walking loops like the one currently in the Brennan Recreation Area should be added on the northeast corner of Joy and Spinoza and in the Sorenson Recreation Area (see map on the next page). Other new segments of paved paths should be added along the south side of Joy Rd and by converting the existing paved roadways to pedestrian and bicycle-only paths at Outer Drive between West Chicago and Rouge Park Drive, Dover between West Parkway and Outer Drive, West Chicago between Trinity and Spinoza, Tireman between Parkland and Outer Drive, and Sawyer between Pierson and Spinoza (existing paths are shown in black on the accompanying map, new paved paths are blue and existing concrete sidewalks are white). Park benches with garbage cans should be added every ¼ mile along all paved paths. Completion of these paths would create a five mile loop without ever having to cross a single road. Currently, parking is allowed anywhere along any roadway in the park. This encourages illegal dumping and other illicit activity, and makes patrolling the park to keep legitimate park users safe very difficult for our police. Designated parking at designated park amenities, with garbage cans, will reduce litter, discourage illegal activity and allow police to focus on patrolling these areas. Parking areas are marked on the master plan map with a “P”. The three pedestrian bridges in the park should be restored. The Stone Bridge needs minimal repairs and the Sorenson Promenade Bridge and the Lahser Bridge need to be rebuilt. Reducing cut-through traffic by permanently closing redundant access roads will greatly enhance the safety and quality of the park experience for park users. It will also reduce the number of temporary closure gates necessary for closing the park to traffic on the weekends. The city will promote the use of the park during weekend closures similar to the way Hines Drive currently does. Way-finding signage should be placed throughout the park in a manner that allows visitors to easily find all the amenities in the park. In addition, Park Rules signs with pet waste bag dispensers should be prominently placed at parking areas, trailheads and other high use areas. Mileage markers should be placed along all of the paved paths. No Dumping signs and No Motorized Vehicles signs should be placed in appropriate areas. Attractive entrances to the park should be developed at the Warren Ave., Joy Rd., Plymouth Rd., Outer Drive and Rouge Park Drive entrances. These entrances, as well as the way-finding signage, should be designed consistent with the nature theme of the park. The goal of this design is to make Rouge Park a world class urban amenity, and a popular neighborhood, regional and tourist destination. Attractions such as the observation tower with views of downtown and the Ambassador Bridge, and a series of summer fairs and festivals at the Joy & Spinoza Festival Grounds, several major 5K and 10K runs, and weekly summer concerts at the large amphitheater will draw large numbers of residents and tourists alike. No tourist brochure for the city of Detroit should be complete without listing attractions in Rouge Park. Finally, the upcoming 100th Anniversary of the park in 2023 will provide an opportunity for a grand re-opening of the park with a major promotional effort including the official renaming of the park from it's current “River Rouge Park” (which is easily confused with the city of River Rouge) to the Rouge River Nature Park (though it will always be referred to affectionately as simply Rouge Park).